Slightly peeved as i will be out at Sonar for this one - WHO AM I KIDDING - SONARRRR!! 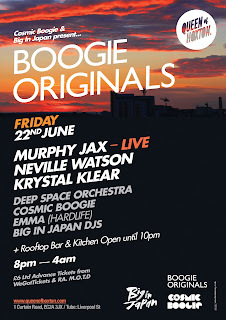 Seriously though.. Stu Cosmic Boogie has put this super tidy line up together which sees a slight departure from our Soundtrack Set series for now but does feature our first live act in this series of collaborations where the Big in Japan crew feature. Hit the poster above for a link to the facebook event. Back once again following a series of behemoth parties which played host to the likes of Todd Terje, JD Twitch, Greg Wilson and many more the cosmic boogie & big in japan tour de force have pulled together yet another stellar line up which includes a special live performance from Murphy Jax alongside a host of top quality dj talent playing house, disco, funk and no doubt a little Boooogie! ROOFTOP BAR & KITCHEN OPEN TILL 10PM FOR BEERS AND BBQ IN THE SUNSHINE! My favorite Talking Heads remix to date.. No surprises who its from then eh! 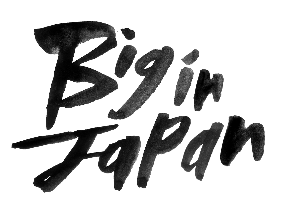 Leftside Wobble will be back at the book Club for the next Big In Japan party on the 29th June alongside Guy Williams (Paradise 45). watch this space for some fresh new artwork & more details on the party very soon! Disco Deviance w/ Rahaan - Tonight! If your looking for something fun this evening - this should hit the spot! Disco Deviance are very excited to welcome one of their favourite DJs and the disco man himself Rahaan to guest at their new bi-monthly residency. Rahaan has been spinning music since the 1980s. He got his schooling in disco music when he heard Ron Hardy play in his native Chicago. Hardy’s raw and real DJ style left a long lasting impression on him. Drawing on a massive record collection, Rahaan mixes up the rare with the more accessible, and his trademark edits always rock the floor. Above all, the essence of Rahaan’s sound is still undeniably Chicago in its energy. You can literally feel the music, sweat and funk in the air. 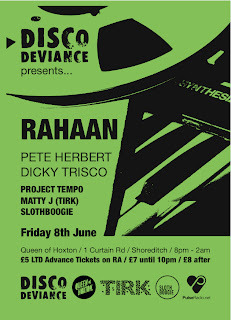 Joining Rahaan behind the decks in the basement will be Disco Deviance residents Pete Herbert & Dicky Trisco. This Dynamic duo are behind many of the imprint’s best selling releases and form a formidable DJ partnership melting the boundaries between funk, disco and house in the constant search for the best party vibe they can produce. The irresistible sound of their DJ sets has led to constant touring around Europe, Australia, Japan and South East Asia. In the bar area, Matty J from Tirk Records and We Love…fame will be mixing it up alongside the mysterious Project Tempo from Paris whose releases have attracted major support from the likes of Greg Wilson, Dimitri From Paris & Ashley Beedle. This is the first opportunity to hear PT do their cut up and dubbed out disco boogie in the UK so is not one miss. And finally top blogger, crate digger and hot disco DJ Slothboogie will be joining them. Report to the dancefloor…100% disco all night long! !